lenNY's Yankees - A Bronx Bombers Blog: Steroid era crisis? I just got word that commissioner Bud Selig is contemplating a suspension for A-Rod, due to his admission of PED use when they were illegal in baseball. 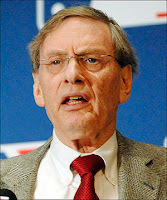 One thing holding back Selig from suspending him right now is that the test he tested positive in was an anonymous survey. Also, A-Rod never admitted to the specific PED he used, which makes it harder to suspend him. This is a huge deal folks. I've been thinking a lot about what the aftermath of the steroid era should be. I am focusing on hall of fame eligibility as well as any sort of records. The use of PEDs defies integrity, sportsmanship, as well as character. That is enough for me to deem any one of these players ineligible for the Hall of Fame. Now as far as dealing with the records, I want to make any one of these players ineligible for the record books. Yes, this means Roger Maris' 61 homers are still in the lead, as well as Hank Aaron's 755 dingers. I'm sorry, but you have to come down hard on these players. I'm sure in most cases, these players are thinking, "If I use these PEDs, I can get good enough to earn myself a hefty contract." I'm sorry for the Andy Pettitte's of the world, but you still were dumb enough to use them. Illegal or not, it is still immoral to use them and goes against everything the Hall of Fame stands for. And I certainly don't want inflated statistics reinventing the record books. Big name players such as Barry Bonds, Roger Clemens, Alex Rodriguez, Rafael Palmeiro, Mark McGwire, Sammy Sosa and now Miguel Tejada can kiss their careers good bye. I would start by suspending Bud Selig and his $17 million salary. It's he, in concert with the players' union, who looked the other way while this whole thing went on (and maybe still is going on). I agree as far as the hall Of fame is concerned. But there will be books written forever that will have the "Real" records in them and most fans will know that Aaron is the Home Run King and Maris has the single season record. If I was the mayor of Cooperstown I would have a Museum built with a Hall Of Shame with all the "Great" Stats Guys (Bonds, A-Rod, McGuire, Clemens, etc) and there stories in the building so that baseball fans of the future can see all about these idiots who stained the game.